Wind was blowing hard today. It rained almost all day. We were under tornado watch. I don't feel comfortable when I see weather alerts on my Droid. Local friends tell me not to worry during the watch, but I should look for a safe place when there is a tornado warnings. I don't know about them but watches make me nervous just as much. I am scared off those thunderstorms with incredible lightnings and thunders... Forget earthquakes. When a storm systems comes in, I just cover myself with a blanket on the sofa in the living room until it's over. Big progress since last year (after we just moved here from Seattle), when each thunderstorm I spent in ... closet zipped in a sleeping bag. 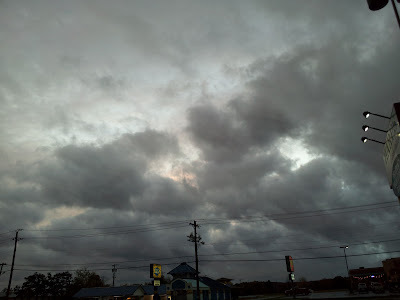 Today gray sky and moderate possibility of severe weather from the Storm Prediction Center kept me inside all day. 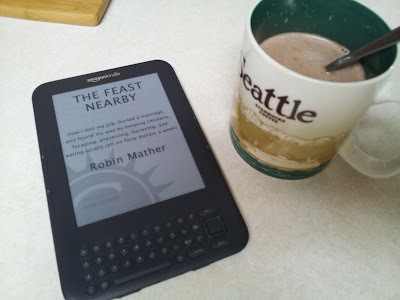 In the morning I had a home version of Starbucks mocca and sip by sip I finished reading Robin Mather's book The Feast Nearby. It was easy to read and somewhat inspiring. Some useful recipes too. Then, for lunch I had just plain salad: tomatoes, cucumbers, onion, dill, and drizzled with olive oil. 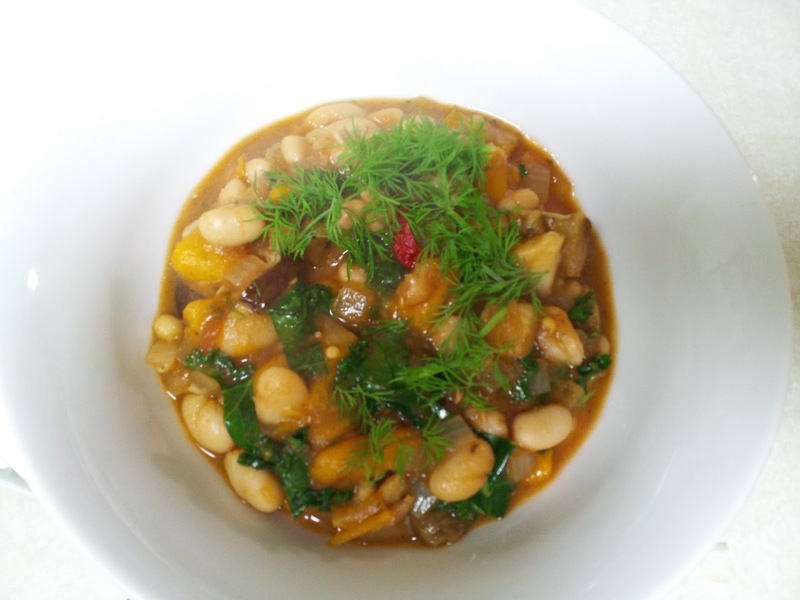 For dinner we all wanted something warm and cozy, so I made a leftover bean stew. I didn't expect it would be so delicious! And very easy to make. Here is how. I sauteed one medium onion, chopped, in a teaspoon of olive oil. Then I had a little of spaghetti sauce left in the jar. I added it to the pot when onions were golden brown. I also had some white northern beans, few rings of roasted eggplants, couple of roasted bell peppers: all went into the simmering sauce. Two minutes later I added kale piked from my garden (yes, it's Kale Tuesday, we had to have some kale!). I stirred it a few times, sprinkled with salt and pepper and dinner was ready. I have a new book on my Kindle. Wow - that dish looks SO amazing! 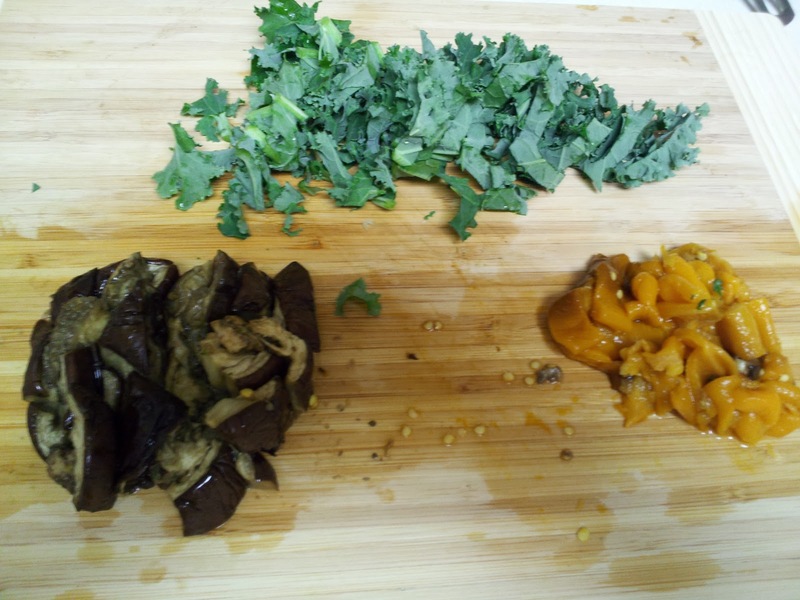 I love, LOVE the idea of KALE Tuesday and am your newest subscriber via Google Follower just to see what you come up with in kale recipes! I'm glad you're safe from the storm...and Kindles ROCK, don't they?! 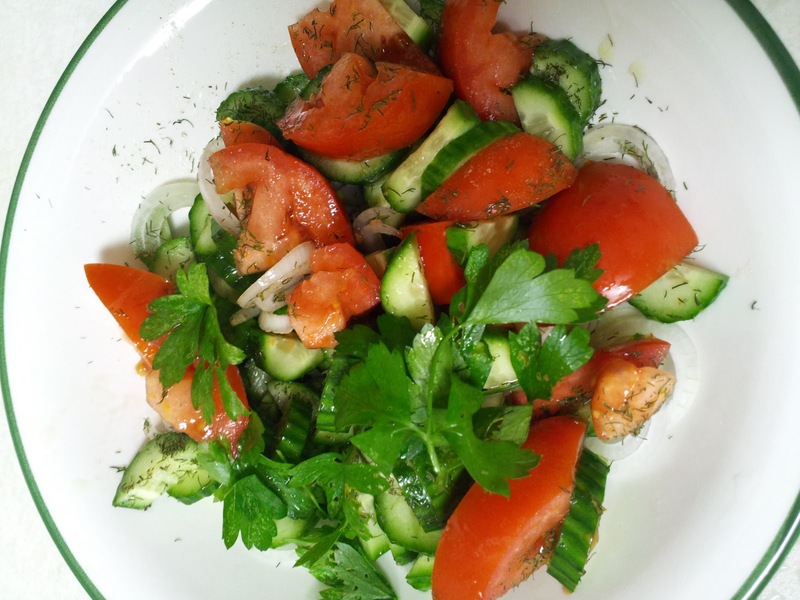 This salad looks so Greek to me... With this weather I would have a soup though :-)! !